Keep Secure Tinder Account From Being Hacked | Security Tips: Hello Everyone. Are you a Tinder user? If yes then the post is for you. Now you Have to use the Tinder app at your own risk. A report coming from a security researcher stats that hackers can access your tinder profile, read your messages easily if both are on the same wifi network and surprisingly, you’ll won’t even know about it. Everything happens without your knowledge or permission. Also, misuse your personal details. A Tel Aviv-based security research firm named — Checkmarx has found the vulnerability and uncovered that there are two flaws namely — CVE-2018-6017 and CVE-2018-6018 in the app on both Android and iOS Tinder app. So hackers can very easily access your Tinder account and view or use all your personal details and keep a check on all your actions as well. This means that the hackers can hack and keep accessing your profile, all the profiles that you view and also know when you swipe left or right, and even more. The researchers further note that Tinder for Android as well as iOS lack basic HTTPS encryption. This means that anyone can extract your Tinder pictures and other personal data Also, misuse your personal details. Hence, because the dating application doesn’t use any encryption measure to prevent user information from hackers. The security research firm, “It’s the combination of two simple vulnerabilities that create a major privacy issue.”, However, To demonstrate the vulnerability, designed an application called the Tinder Drift. They also created a video to show on the application can be used to follow users’ actions on Tinder if the person is sharing the same Wi-Fi connection. Check it out below. 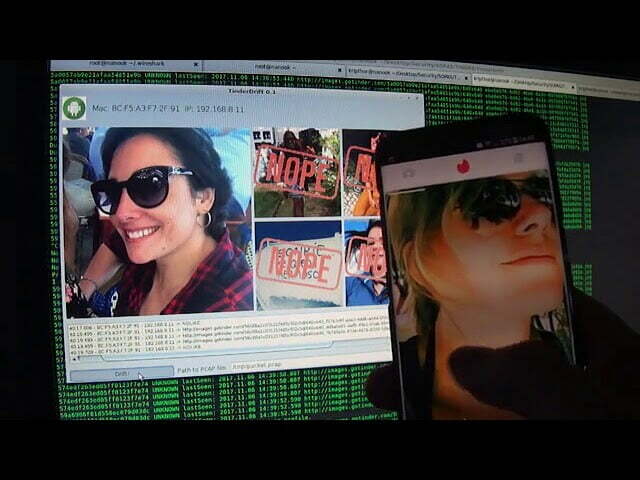 How Can Tinder Account be Hacked by Hackers? The Researchers stats that Tinder account can be easily hacked if both the user and hacker are on the same Wi-Fi network. So, in this case, your tinder account is prone to hacking if you are connected to public Wi-Fi. Attackers can see any photo the user did, add their own images into their photostream, and also see whether the user swiped left or right. Left swipe to reject is 278 bytes, a right swipe is designated by 374 bytes, and a match of 581 bytes. This pattern blended with the use of HTTP for photos results in major privacy issues, enabling attackers to see what action has been taken on those images. Don’t Use Public WiFi network while Accessing Tinder Profile. If you use an open or Public Wi-Fi to access your Tinder account, well, beware, you may be the next target. Avoid using public Wi-Fi networks, until developers take measures or build basic HTTPS encryption. Hope you like this post about How to Keep Secure Tinder Account From Being Hacked | Security Tips. Having any issues feel free to drop your comments below. Please share this post.